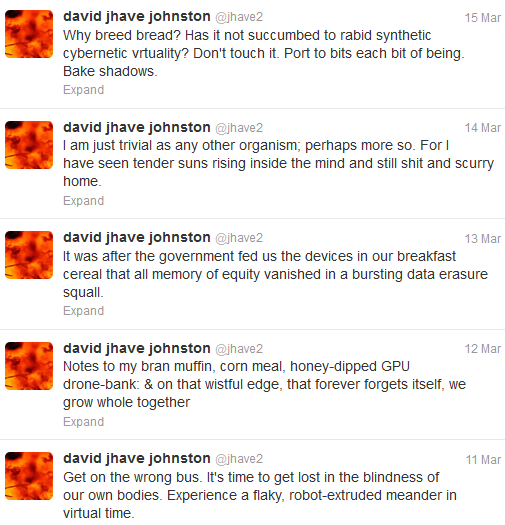 For the past three years, Jhave has been using his Twitter account as a platform for a poetic constraint. Whenever a person follows him (that is, not a ‘bot) he writes a tweet poem that is exactly 140 character long. As one can see in All My Tweets, he had started this practice before, but committed to it on February 8, 2010— “continuing the anti-pragmatic stance of twitting (doesn’t that sound absurd?) only whn followed by a non-robot and always with exact letters”— and has since adhered strictly to the constraint. Read individually, each tweet is a concentrated prose poem: a conduit for Jhave’s imaginative, political, and bodily voice. He claims his tweets “never reference much of a reality” but I think they do— they are tweet-sized stream-of-consciousness performances, snapshots of his thought process. Read the examples above, all written within a few days of each other and you’ll notice there are threads that weave in and out of each tweet, such as an interest in grain-based products (bran muffin, corn meal, bread, breakfast cereal), perhaps because they were all written in the morning. Tweets written with greater time intervals between them still share ideas, but not in as high a concentration, which suggests that this is more of a spontaneous performance rather than a large work delivered over time. 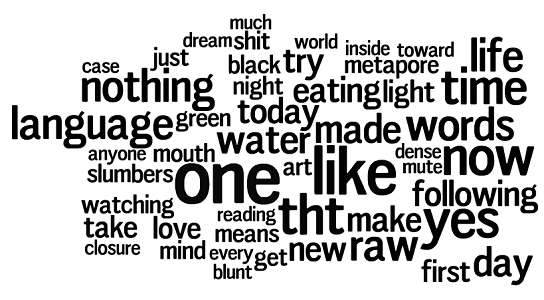 To provide a sense of some of Jhave’s language choices over the course of these three years of performance, I have generated a Wordle word cloud with the 50 most commonly used words, after filtering out the most “common” English words (articles, conjunctions, and such). Those familiar with his work will recognize some of these words choices expressed in his whimsically and powerfully expressive e-poems (read more). Those unfamiliar have a rare opportunity before them: by following him on this social network, they can prompt the creation of a new piece of this social media performance, subscribing to enrich their Twitter stream with occasional and original snippets of poetry.